This seventh SBE Council “Gap Analysis” looks at the issue of trade, in particular, the shortfall experienced in recent years in terms of U.S. exports and the related gap in terms of the number of businesses – especially smaller enterprises – involved in exporting. While there has been a great deal of anti-free-trade rhetoric on the presidential campaign trail this year, freer trade is a big net plus for U.S. entrepreneurs, businesses, workers and investors. Unfortunately, consider that the growth in real U.S. exports has been underwhelming, to say the least, in recent years. 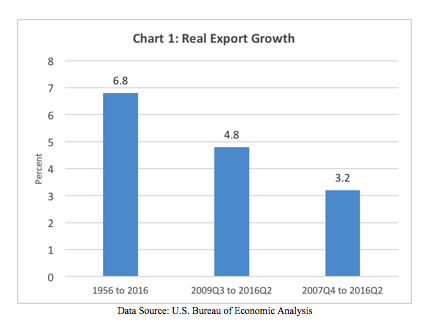 Looking at quarterly GDP data from 1956 to mid-2016, the real annualized growth rate in exports averaged 6.8 percent. Since the start the last recession in the fourth quarter of 2007, real export growth has averaged a mere 3.2 percent. And looking at the current expansion/recovery period, real exports have grown at an average rate of 4.8 percent. 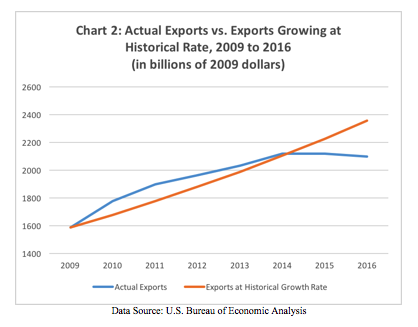 If U.S. annual real exports had grown at the average rate in annual data prevailing from 1956 to 2016 (using the annualized growth rate prevailing through the first two quarters for the 2016 rate), then over the period of 2009 (the year in which the recovery began) to 2016, real exports (in 2009 dollars) would have been $257 billion higher than they actually are estimated to be in 2016. Going back to 2007 (the recession began in December 2007), real exports would have been $635 billion (2009 dollars) higher, if growing at the much higher long-run average growth rate, than they actually are estimated to be in 2016. These lost export opportunities have meant a decline in the number of U.S. exporters, and since most exporters are small and medium-size enterprises, we are suffering a noteworthy shortfall or gap in the number of small business exporters. Among total U.S. exporting firms, exporting firms with less than 500 workers, and exporting firms with less than 100 employees, the average annual growth rates were markedly slower during the periods of 2008 to 2014, and 2010 to 2014, compared to 1997 to 2014, and 1997 to 2007. 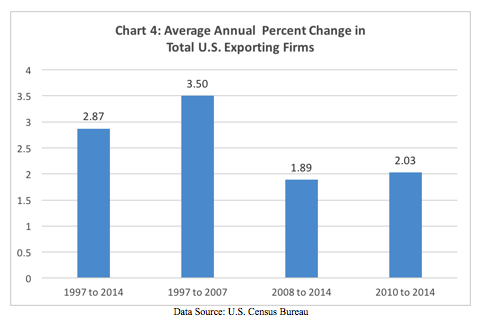 Indeed, if the average growth rate for 1997 to 2007 had prevailed over the period of 2008 to 2014, there would have been approximately 51,660 more U.S. exporting firms in 2014 than there were. The same dire trend is found among smaller exporting firms. If the average growth rates for 1997 to 2007 had prevailed over the period of 2008 to 2014, there would have been approximately 48,870 more U.S. exporting firms with fewer than 500 workers in 2014 than there were, and approximately 49,800 more U.S. exporting firms with fewer than 100 workers. While multiple factors play into the causes for these gaps, key among them are found on the policy front. First, the U.S. largely abandoned its leadership role in advancing free trade over the past eight years, and serious questions regarding future trade policy loom given the hostility toward freer trade expressed by both leading party presidential candidates. Second, a general anti-growth agenda regarding taxes, regulations, government spending and debt, and monetary policy has resulted in much slower U.S. economic growth, which in turn negatively affects global growth, and therefore, international trade. Over the past decade, the U.S. shifted from a few years of respectable economic growth to a long and deep recession, and then to one of the worst periods of economic recovery and expansion on record. As the nation looks to a new presidential administration and a new Congress taking power in January 2017, SBE Council is publishing a series of analyses that highlight key gaps or shortfalls in our economy. The first analysis focused on the GDP shortfall, the second on a lost decade of private investment, the third on the decline of entrepreneurship and millions of missing businesses, the fourth on poor U.S. productivity growth, the fifth on Americans’ suffering lost income, and the sixth on lost jobs. 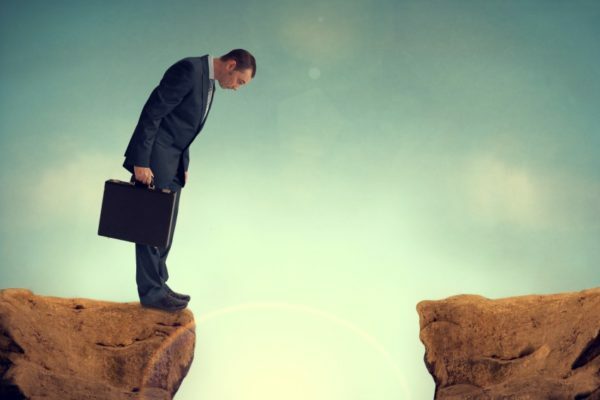 Our trade analysis (this report) will be followed by a final report highlighting the basic policy changes needed to close these gaps. This seventh SBE Council “Gap Analysis” looks at the issue of trade, in particular, the shortfall experienced in recent years in terms of U.S. exports and the related gap in terms of the number of businesses – especially smaller enterprises – involved in exporting. 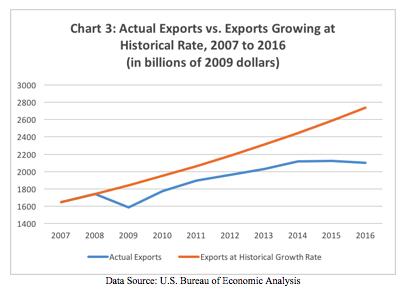 • From 2000 to 2015, the growth in real U.S. exports equaled 22.5 percent of the growth in real GDP, and the expansion in real total trade (i.e., exports plus imports) came in at 41.6 percent of real GDP growth. • Consider that in 1950, U.S. exports came in at 4.22 percent of GDP, imports registered 3.95 percent, and total trade equaled 8.17 percent of GDP. In 2015, however, exports had jumped to 12.56 percent of GDP, imports to 15.53 percent, and total trade to 28.09 percent of the U.S. economy. • A prominent myth is that a trade deficit is an economic negative. However, the data make clear that periods of higher economic growth coincide with shrinking trade surpluses or mounting trade deficits, and slowdowns and recessions coincide with declines in trade deficits. • There is the largely mistaken notion that free trade agreements provide incentives to move jobs to other nations. In reality, it must be kept in mind that U.S. trade barriers already are relatively low compared to other nations, so one of the clear benefits of advancing free trade is to expand opportunities for U.S. businesses and workers in the international market. • According to the U.S. Census Bureau: “Small- and medium-sized companies (those employing fewer than 500 workers, including number of employees unknown) comprised 97.7 percent of all identified exporters and 97.1 percent of all identified importers.” In addition: “Among companies that both exported and imported in 2013, small- and medium-sized companies accounted for 94.4 percent of such companies.” Zeroing in on very small firms, 37.1 percent of exporters had less than 20 employees, and among importers, 42.6 percent also had less than 20 workers. • As for particular trade accords, the U.S. has overwhelmingly experienced solid-to-robust real growth in exports to 17 of the 20 nations with which we have agreements. That includes a 275 percent real increase in U.S. merchandise exports to Mexico since NAFTA went into effect. Imports certainly matter in assessing the U.S. trade situation. Indeed, while many assume that imports are an economic negative that is not the reality. Imports expand competition and choices for consumers (including small businesses). And in general, growth in imports reflects the growth in the domestic economy. That is, if the U.S. economy is experiencing strong growth, then imports will be growing at a healthy clip. In contrast, if the U.S. economy is sluggish or in recession, import growth will slow, or imports will decline. For example, we saw imports drop in 2008 and 2009, reflecting the deep recession. Also, imports have been on a general decline since October 2014. But for the purposes of this analysis, we’re going to take a close look at exports. After all, there is not anything controversial – or at least, there should not be anything controversial – about the importance of increasing U.S. exports. After all, strong export growth means expanding opportunities for U.S. entrepreneurs, businesses and workers. Unfortunately, the growth in real U.S. exports has been underwhelming, to say the least, in recent years (as noted in Chart 1). Looking at quarterly GDP data from 1956 to mid-2016, the real annualized growth rate in exports averaged 6.8 percent. Since the start the last recession in the fourth quarter of 2007, real export growth has averaged a mere 3.2 percent. And looking at the current expansion/recovery period, real exports have grown at an average rate of 4.8 percent. And what if U.S. annual real exports had grown at the average rate in annual data prevailing from 1956 to 2016 (using the annualized growth rate prevailing through the first two quarters for the 2016 rate)? Well, if that rate (5.8 percent) had prevailed over the period of 2009 (the year in which the recovery began) to 2016, real exports (in 2009 dollars) would have been $257 billion higher than they actually are estimated to be for 2016. If we go back to 2007 (the recession began in December 2007), real exports would have been $635 billion (2009 dollars) higher, if growing at the much higher long-run average growth rate, than they actually are estimated to be in 2016. These lost export opportunities have meant a decline in the number of U.S. exporters, and since most exporters are small and medium-size enterprises, we are suffering a noteworthy shortfall or gap in the number of small business exporters. As noted in Charts 4, 5 and 6, the average annual growth rate in the number of U.S. exporters has slowed dramatically in recent years. Consider that the average annual rate of growth in total exporters over the entire period of 1997 to 2014 was 2.87 percent. However, over the period of 1997 to 2007, the growth rate was 3.50 percent. That compared to rates of only 1.89 percent from 2008 to 2014, and 2.03 percent from 2010 to 2014 (a period clear of the recession). If the average growth rate for 1997 to 2007 had prevailed over the period of 2008 to 2014, there would have been approximately 51,660 more U.S. exporting firms in 2014 than there were. This same analysis holds for smaller exporters. For exporting firms with fewer than 500 employees, the average annual rate of growth in total exporters over the entire period of 1997 to 2014 was 2.87 percent. However, over the period of 1997 to 2007, the growth rate was 3.45 percent. That compared to rates of only 1.95 percent from 2008 to 2014, and 2.05 percent from 2010 to 2014 (again, a period clear of the recession). 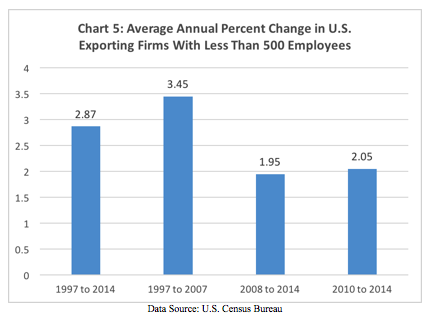 If the average growth rate for 1997 to 2007 had prevailed over the period of 2008 to 2014, there would have been approximately 48,870 more U.S. exporting firms with fewer than 500 workers in 2014 than there were. For exporting firms with fewer than 100 employees, the average annual rate of growth in total exporters over the entire period of 1997 to 2014 was 3.13 percent. But over the period of 1997 to 2007, the growth rate was 3.77 percent. That compared to a rate of only 2.13 percent during both periods of 2008 to 2014, and 2010 to 2014 (a period clear of the recession). 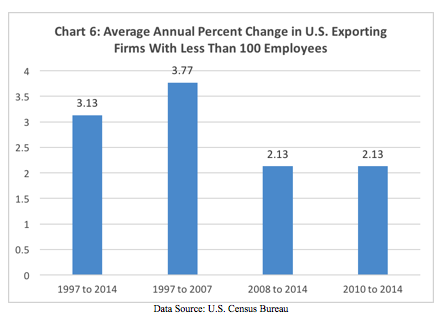 If the average growth rate for 1997 to 2007 had prevailed over the period of 2008 to 2014, there would have been approximately 49,800 more U.S. exporting firms with fewer than 100 workers in 2014 than there were. For eight years now, the U.S. has experienced a falloff on the trade front. Specifically, the growth in U.S. trade has been much lower than the historical average growth rate. That very much includes poor growth in U.S. exports. This has left the U.S. with a substantial shortfall or gap in terms of real exports, and an accompanying gap in the number of U.S. exporting businesses, including small and midsize exporters. While multiple factors play into the causes for these gaps, key among them are on the policy front. First, the U.S. largely abandoned its leadership role in advancing free trade over the past eight years. That fact is made more troubling looking ahead as both major party candidates for president have spoken out against advancing free trade. Indeed, Republican Donald Trump even talks explicitly about rolling back previous free trade accords (in particular, NAFTA), and imposing tariffs on nations like Mexico, China, and Japan. Second, a general anti-growth agenda regarding taxes, regulations, government spending and debt, and monetary policy has resulted in much slower U.S. economic growth, which in turn negatively affects global growth, and therefore, international trade.